Looking for a new way to teach infographics to middle graders? 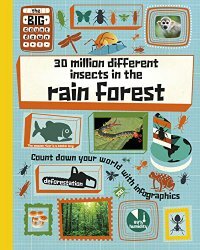 30 Million Different Insects in the Rainforest (The Big Countdown) by Paul Rockett and illustrated by Mark Ruffle is all about visualizing numbers and infographics. Although the title might cause you to believe this book is about insects, it is actually about rain forests. The first two-page spread is a map that shows where tropical and temperate rain forests are found throughout the world. Tucked in around the sides are infographics about the numbers of plant and animals species per 1 km² and how number of species are evaluated. The next infographic does show the number of insect species of seven major groups found in the rain forest. This particular graphic is interesting because the numbers increase from top to bottom, instead of the more traditional bottom to top. The reverse placement emphasizes the need to pay attention to the scale when reading graphs. Continuing on, the reader will find out more about rain forests, including the people that live there, the layered structure, and even about poison dart frogs. Why it is so important to protect the rain forests is emphasized, particularly how rain forests are important for oxygen production. 30 Million Different Insects in the Rainforest is a catchy title that will help children learn the basics of handling data and statistics, while also learning about how important rain forests are to our planet. In a world that increasing relies on infographics to present complex information visually, this book is a great way for students to get prepared. This review was originally posted at Wrapped in Foil blog.